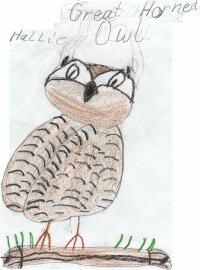 We started our research by contacting the Medicine Lake Wildlife Refuge to find out which owls we have in our area. Mike Rabengerg told us that the Great Horned Owl lives here year round. The Long-eared, Short-eared and Burrowing Owls spend the spring and summer months here. The Snowy Owl migrates here in the winter. We decided to research three of those owls and to base our reports on "The Important Book" by Margaret Wise Brown. Our teacher thought the format of the book would help us learn how to write paragraphs. We also drew lifesize pictures of our owls and displayed them and our reports in the school lunchroom. 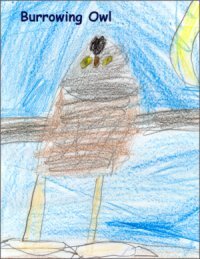 We cant wait for the snow to melt so we can go out exploring and see if we can find any of these owls as they are nesting. The important thing about Burrowing Owls is their feathers are brown and white. They are 9 to 10 inches tall. Their wingspan is from 20 to 24 inches. But the important thing about Burrowing Owls is their feathers are brown and white. The important thing about Burrowing owls is that they may eat animals that have been poisoned and die. Burrowing Owls sleep in the daytime and hunt at night. They eat gophers, ground squirrels, mice, rats and other small mammals. But the important thing about Burrowing Owls is that they may eat animals that have been poisoned and die. The important thing about Burrowing Owls is that they sound like rattlesnakes to keep their enemies away. Burrowing Owls live in burrows that were made by other animals. In winter they migrate to warmer climates in the southwestern United States. But the important thing about Burrowing Owls is that they sound like rattlesnakes to keep their enemies away. The important thing about Burrowing Owls is they lay 6  9 white eggs in March or April. The eggs are laid a day apart. The female sits on the eggs for 28  30 days until they hatch. The babies go out on their own after about 44 days. But the important thing about Burrowing Owls is that they lay 6  9 white eggs in March or April. The important thing about the Great Horned Owl is it can grow from 18 to 25 inches. Their wingspan is 36 to 60 inches. The color of their feathers are white, dark brown, dark rust to brown. But the important thing about the Great Horned Owl is it can grow from 18 to 25 inches. The important thing about Great Horned Owls is that they usually live in trees. They find nests made by other birds. They sometimes build their nests in hollow trees. They usually stay where they are when winter comes. The Great Horned Owls are common in Montana. They are the owl most often observed by the public. But the important thing about Great Horned Owls is that they usually live in trees. The important thing about the Great Horned Owl is that they lay 2 or 3 eggs in January or February. The eggs hatch in 30 to 35 days. The owlets go out on their own when they are 45 to 55 days old. The important thing about the Great Horned Owl is they may take prey 2 to 3 times heavier than itself. The Great Horned Owls eat all kinds of mammals, reptiles, amphibians, fish and insects. They hunt in the night time and sleep in the day time. But the important thing about the Great Horned Owl is they may take prey 2 to 3 times heavier than itself. The important thing about Snowy Owls is that they come to Montana in winter. Snowy owls live in the arctic tundra. They nest on the ground or on hummocks in the summer. But the important thing about Snowy Owls is that they come to Montana in the winter. 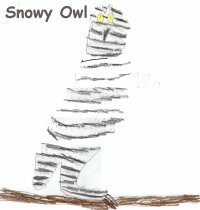 The important thing about snowy owls is that they can get from 20 to 27 ½ inches. Their wingspan is from 54 to 65 inches. They are white with dark brown and black barring. Adult males are almost pure white. Adult females are darker. But the important thing about snowy owls is that they can get from 20 to 27 ½ inches. The important thing about the snowy owl is that the baby owls are born from March to June. The snowy owls lay 5 to 8 eggs at about 2 day intervals. The eggs hach in 32  34 days. The parents feed the owlets. The owlets go out on their own when they are 8 weeks old. But the important thing about the snowy owl is that the baby owls are born from March to June. The important thing about the Snowy Owl is they can eat about a dozen rodents in a day. The parents feed the owlets about anything they can get. They hunt at night. They sleep in the daytime. When there is not very many voles and lemming the snowy owls go to the northern United States to find more food. But the important thing is they can eat about a dozen rodents in a day.